We are now collecting pledges! You can pledge membership by filling out the form here. Why not collect my membership equity contribution now? Before we take your money we need to accomplish a few important goals: (1) we need to file for incorporation, which we will do in the coming months; (2) we need to ensure we have the systems in place to safely and securely accept and track everybody’s contribution; (3) we need to make sure that there is enough commitment in the community make the Co-op a reality to warrant taking your contribution. We have dozens of dedicated volunteers working towards fulfilling these goals. When we are ready to collect your pledge, we will be in touch with you! How long until a co-op marketplace is opened in Ambler? “It depends!” With a co-op run by us, the Co-op members, we will need to raise the money ourselves! Membership equity contributions will provide some of the capital needed to open a store, in addition to loans and grants. The faster we raise the money, the sooner we open. Of course along the way we will have to find a great location, hire a general manager and fulfill a number of other critical steps—so get involved! There is a lot to do! How does membership equity work? Membership equity is your capital investment in the Co-op. Whereas other types of businesses acquire capital from private investors or by selling shares on the open market, the Co-op relies on its membership for the money used to open a store, purchase inventory and run the business. Should you choose to withdraw your support for the Co-op at any time, our co-op bylaws will lay out the details of taking your membership equity with you. Our membership equity is set at $400, which is similar to other area co-ops. While we will encourage everybody to pay their equity in full, so that we have the capital to open a store sooner rather than later, there will be payment plans available. The minimum equity payment is $40. Will I have to be a member to shop at the Co-op? What benefits do I get by becoming a member? Without memberships we will not be able to open a cooperative marketplace in Ambler. We need a strong core of support to start a retail grocery store that is owned by and operated for the benefit of the community. One person cannot open a co-op for $400, but 1,000 people can! While our store will be open to all, members will receive special discounts; but, more importantly, they will know that it is their store that they helped to create, and that they can help operate! How is the Co-op being organized? At this point the Co-op is run entirely by volunteers. There are all kinds of volunteers in our organization: some who are committee members and meet regularly, some who volunteer for events or other discrete tasks, and some who work behind the scenes to move us ahead. We at Ambler Food Co-op have also been offered great help and advice from other co-ops in the area. There is a growing movement in southeastern Pennsylvania and nationally to run cooperative businesses because, as studies have shown, cooperatives bring more financial and social benefits to the community than privately run companies. Feel free to contact us to see what you can do to help us with this community effort! Have more questions about pledging your membership? Please see our What is a co-op? page for more answers! On September 29th, Keystone Development Center (the consulting group we are working with) led two focus groups as part of their feasibility study for the Ambler Food Co-op. Both focus groups were held at First Presbyterian Church in Ambler, so first off, we’d like to thank them for allowing us to use their space. The first focus group consisted of non-committee members and ran from 11-12:30. The second focus group consisted of committee members and ran from 12:30-2:00. As a committee member, I attended the second focus group. Oh, and did I mention Ambler Pizza donated pizza for both focus groups? Thank you, Ambler Pizza! It was delicious! Describe your household . . .what type of home do you have, name the nearest cross-street, how many people in your home, if kids, what are their ages? How long have you lived in Ambler and do you plan to stay? List the stores where you do your grocery shopping currently, and how much do you spend weekly? How much of your weekly spending is on non-food items? If there was a co-op, how would that change your shopping habits? Would the co-op replace your main Grocery Store? How important is parking to you? Is it a deal breaker? Are you willing to pay the Membership Fee? Why are you involved in the Co-op? On September 22 some Ambler Food Co-op volunteers and I spent the day at the Lower Gwynedd Countrie Picnic at Penllyn Woods. Attending this particular event was a first for all of us, so we we did not know what to expect. The weather was perfect (ok . . .if you want me to be honest, it was a little windy) and a great time was had by all. Check out our slideshow below to see some pictures from the day. We’ve been at a number of events in Ambler, but this was one of our first events outside of Ambler. We were able to meet a lot of new people, and educate those who had never heard about the Co-op. We handed out flyers with information about our upcoming community meeting on October 18, along with bookmarks and business cards with our web address on it. And, for a brief period during the day, we had a limited supply of Aloe plants to give out, free to good homes! Anyone who stopped by at the right time, got their pick! One of the main attractions at the Countrie Picnic was a $5 “Taste of Lower Gwynedd” where picnic goers could sample food from all Countrie Picnic restaurant participants. The restaurants included Arpeggio, Andy’s Diner, Il Giardino Pizza Café, Mina Cucina Rustica, La Villa Mexican Grille, Scoogi’s Classic Italian Restaurant, The Spring House Tavern and Toni Roni’s. Alternatively, if you were not feeling so adventurous, for $5 you could get a hamburger or hot dog, chips and a drink. A bake-off was held where some lucky individuals sampled and judged some delicious desserts! There were 4 or 5 moonbounces set up where kids could bounce as much as they wanted, for free! As a parent, I know that’s pretty awesome! There were also train rides (not on a track), a helicopter on display, a scavenger hunt, hula-hooping, a demo by Canine Country, and the Abington K-9 unit. There was also a “ball drop” raffle. Balls were purchased and labeled, and then hoisted above by a fireman who had climbed way up high on a ladder extending from a fire engine. And then . . .you guessed it . . . he dropped them. Check out our pics for an action shot of the balls dropping (I was proud of that one!). The person whose ball landed closest to the center of a bulls-eye painted in the grass, won. All in all, a great day, and we were so glad we were able to spread the word about the Co-op to some folks in Lower Gwynedd! Introducing . . .the official Ambler Food Co-op Logo! Over the past several months, I have listened to peoples’ thoughts and ideas regarding what this co-op means to them. I took this into consideration as I thought about and developed what I would like to see in our logo. It seemed natural to me to find something that represented food and community and come up with a way to tie them together. This brought me to use of a pitch/hand/fork concept to represent farm/community/food. My thought was that by using the three similarly shaped symbols, a sense of continuity would be achieved. In addition, spacing these similarly shaped elements equally apart reminded me of crops, adding to the sense of the co-op being a growing, organic form. The fact that the individual images are similar, yet still different from one another, represents both a like-mindedness of the members/community in that we are all looking to achieve a goal, while at the same time, their differences represent diversity, both of culture and interests. I am very excited and extremely honored that this logo was chosen as the logo for the Ambler Food Co-op. I look forward to seeing how it will play a part as a recognizable face of the Co-op during its’ continuing development. Thank you Josh! We love it! Nine months after the first community meeting, the committees of the Ambler Co-op plan a rousing gathering on for October 18, at 7 PM. It will be held at the Ambler Theater. This meeting’s goal are to educate people about co-ops, to bring the community up to date on what has been achieved so far and to point the way down the road to what’s next. It is almost a year since a small group of interested people met to discuss the idea of developing a co-op in Ambler; to have fresh local food, close at hand. The year 2012 is the International Year of the Co-op and crowds of supporters showed up for the first community meeting in January. Many signed up for the steering, finance/legal and Membership/Outreach/volunteer committees. These folks have put in hundreds of hours navigating the vast field that is co-op development. They have visited other co-ops, attended workshops and conferences, circulated a survey that would help ascertain the feasibility of an Ambler Co-op. And much more, that will be presented at the October meeting. Co-operative action is as old as time and a survival action for our oldest forbears. Tribes hunted together and shared the meat. Weavers formed guilds to protect their trade. Worldwide, there are now a billion members of various trade, farm, banking, carpentry, pottery, and community organizations. They are the truest and most useful of democratic actions. In America, where food co-ops have sprung up, businesses and trades around them thrive and communities experience more of neighbor knowing neighbor and decreased crime rates. The founders of the Ambler Food Co-op realize this and hope that the attendance of the second community meeting on October 18, at 7 PM at the Ambler Theater is even greater than the first one. There is much to be gained by all. Meet Shoshanah Murray, a recent addition to our MOV (Membership/Outreach/Volunteer) committee! 3. How long have you lived in Ambler? 3 years, we moved from the Northern Liberties in Philadelphia. 4. List the locations where you’ve lived in the past. 5. How did you hear about the co-op? 6. What do you like best about Ambler? 8. What is your favorite activity? Spending time with my family, creating art and other things and reading. 9. What’s the thing you are most looking forward to about our co-op? Having fresh and local food within walking distance. 10. What is your first experience with a co-op? There is a co-op near my childhood home – they always had the coolest things there. 11. What’s your favorite thing to do in the summer? Go for walks in the evening and get some ice cream, watch the fireflies in the backyard. Usually coffee, but tea in the winter. 13. You may not have known that I …. Understand several languages, but only speak two. 15. What is your favorite food? Right now, I’ll go with Chili Chocolate. 18.What’s a “hidden” gem of the Ambler area? 19. Favorite local community event? My kindle – I love to read, and my green boots, they’re just so sassy! What’s raised over 39 million dollars for family farmers and has been going strong for 27years? Farm Aid!!! Depending on your age, you may recall the Live Aid concerts, held simultaneously in London and Philadelphia on July 13, 1985. 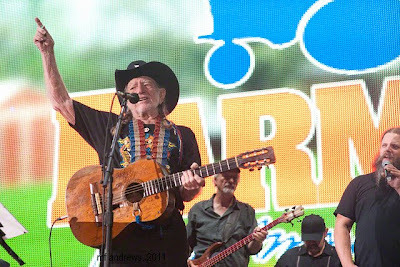 The whole idea of Farm Aid was born that day, when Bob Dylan said on stage “Wouldn’t it be great if we did something for our own farmers, right here in America?” And with that, the idea of Farm Aid was born. Willie Nelson, Neil Young and John Mellencamp immediately got to work. The 3 musical icons put together the first Farm Aid concert in only 6 weeks. It was held in Champaign Illinois and raked in over $9 million for American farmers. And they haven’t stopped since. Farm Aid is currently the longest running benefit concert series in America. Not only is this a music festival, but it is a food festival as well. Concertgoers will be able to enjoy Farm Aid’s HOMEGROWN concessions (family farm-identified, local and organic foods). Along with eating the food, they will be able to meet farmers and engage in farm activites to learn all about how farmers not only provide us with healthy food, but enrich our soil, protect our water and grow our economy at the same time. You may be wondering, specifically how does Farm Aid help farmers? I personally always assumed Farm Aid provided “aid” in the form of money to farmers, right? Actually, due to their incorporation with the IRS, they are prohibited from providing loans or grants to any for-profit business, including farms. Instead, Farm Aid funds a variety of support organizations as part of a nation-wide Farmer Resource Network. The Farmers Resource Network connects farmers to a variety of direct services like, direct marketing assistance, funding opportunities, conservation programs and crisis assistance. Speaking of crisis assistance, many family farmers all over America are currently facing the worst drought they have ever seen. To help Farmers currently dealing with weather-related disasters, Farm Aid established the Family Farm Disaster Fund. If you would like donate to the fund you can do so here. Your donation can help farm families buy food, cover living expenses, and support organizations that provide legal, financial and emotional counseling to farm families in need. Currently Willie Nelson is the President of Farm Aid. John Mellencamp and Neil Young are still on the board, and Dave Matthews has also joined the board. A small group of Ambler Food Co-op volunteers recently went on a “field trip” to Weaver’s Way Co-op. We began our day at the Mt Airy, Carpenter Lane store which also houses the corporate headquarters for Weaver’s Way. The creative use of space was impressive and was certainly inspirational for the Ambler group. The store is housed in all three floors of the corner row property with food prep and storage in the basement, and a cool dumbwaiter for moving items up to the retail space on the upper two floors. The offices and employee lounge filled the three floors of the attached property. The group has worked to create a “village” concept, with plenty of shared space for co-op staff and community members alike. Sidewalk space allowed for plant sales, al fresco dining, a rain barrel, and compost station. Down the street, we visited the Weaver’s Way cooperative pet store! The journey continued to the Weaver’s Way Co-op Farm in Germantown, just a short drive from the store. Here full-paid farmers, interns and volunteers work, supplying fresh local fruits and veggies to the stores. Our group enjoyed the peaceful oasis and was even treated to a tour of the farm’s composting outhouse! From there we made a stop at the Saul Agricultural High School, where Weavers Way Co-op Farm, Weavers Way Community Programs and W.B. Saul High School of Agricultural Sciences have collaborated on a Community Supported Agriculture (CSA) farm located on the grounds of Saul High School on Henry Avenue in Roxborough. The journey concluded with a tour of the Weaver’s Way Co-op in Chestnut Hill, where we enjoyed a lovely outdoor picnic with food from their fresh prepared foods department. This store is considerably more modern inside, but makes great use of an old market storefront, preserving the quaint Chestnut Hill feel. Both co-op store adaptations provided ample food for thought for our Ambler Food Co-op group! Many thanks to all the Weaver’s Way board members, employees and volunteers who hosted, answered all our questions and generally made us feel so welcome!